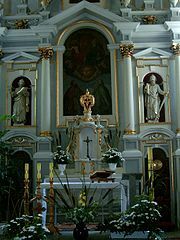 The discipline of the Oriental Church on the subject of altars differs but little from our own. With them the altars must be of stone also. However, in the absence of a regular altar they will say Mass on certain cloths called Antimens; nay, even on a leaf of the Gospel, if necessity presses. Antimens.—This word is sometimes written Antimins, and nearly always so by the Greeks; but as it is evidently derived from anti, instead of, and mensa, a table or altar, we prefer writing it as here, because it is more suggestive of its origin. These antimens are held in great veneration by the Orientals. Their material is generally silk, but in some cases linen also is used, after the manner of our corporals. They are consecrated with much ceremony, relics being pounded up with fragrant gum, and holy oil being poured out together with them by the bishop and cast upon them. Then the Office of the Holy Eucharist is celebrated on them for seven successive days before they are fully consecrated. The date of their consecration is generally worked upon them, also the name of the consecrating prelate (Neale, Holy Eastern Church, vol. i. p. 186; Hierurgia, 504; Goar, Euchol Græc., 653). They measure about sixteen inches square, and have generally a figure stamped upon them representing the burial of our Lord by Joseph of Arimathea and the holy women (Romanoff, Rites and Customs of the Greco-Russian Church, pp. 84, 85). The discipline of the Russian Church is so strict regarding these sacred cloths that no church can be consecrated without them. When not in actual use, they are carefully folded up in a silken cloth called the Iliton (ibid.) Instead of these antimens, the Syrians use, when pressed by necessity, slabs of wood called Mensæ, which they also employ, when the notion takes them, even though regularly consecrated altars can be had (Neale, 187).